This topic will probably get more action from me in coming months. This post will be a quick informational one to start a conversation so that I can get more information. The California Student Bill of Rights Initiative (link to .pdf of initiative text) seeks to allow students anywhere in California access to UC approved course curriculum. Sounds great. David Haglund, the sponsor of the initiative, intends for the state to make this happen by attaching funding to the course, not the school. And the initiative allows for private providers to offer the services. The initiative also puts control of the contracting in the hands of the districts instead of the state. However, the initiative places the hands of writing all necessary laws to accomplish the goals of the initiative in the hands of the legislature. This could eventually mean that although the districts are responsible for contracting online providers, it may be the state who determines the providers that get onto an acceptable list; in the same way that schools must choose from state adopted textbooks when they enter review for insufficient NCLB gains. I copied the text from the bill that gives me pause.. The “other approved provider” phrase leaves a gap the size of Alaska from my perspective. This article from California Watch does a nice job of introducing pro and con positions. I tried to get a read on David Haglund’s political intentions by Googling the crap out of him. He gets a lot of praise from Tom Vander Ark. He has retweeted positive tweets about Jeb Bush’s Digital Learning Now. His LinkedIn profile indicates that he is a program committee member for iNACOL. It appears that he is still a practicing public education administrator in Riverside. What say you? Is this a good idea launched in a bad way? Is the clause that allows districts to make their own contracts an improvement on the Ohio, Pennsylvania, and Colorado disasters? Do you think the California Student Bill of Rights Act is all gravy? Thanks for this great post! I will be using it to teach my students about conducting research, qualifying the credibility of sources and for insight on our current topic of education reform. You just gave me the best compliment I could ever wish for. That you trust my work enough to use it with your students is a real feather in my cap. Thanks, Betaclassroom! Hi Jack. Thanks for the thoughtful post. It is always interesting to see how things we do are viewed by others and I certainly have had lots of that these past few months. I thought – at your suggestion in separate communication – that I would try and address a few of the questions. I am a principal of four schools in the Riverside Unified School District, including the Riverside Virtual School. While this initiative is not a function of that capacity, my passion for promoting educational access has roots in the work I do in Riverside. I have been a public school administrator since 2003 and taught middle and high school in the years prior. I started my career in a rural school district in San Bernardino County and have since moved into the Riverside school system, As a leader in the public school system, I provide support for districts across the state looking to move into the online and blended learning space. While I have good relationships with many of the tech innovators associated with iNACOL and ISTE, this specific initiative was conceived within the conversations of numerous public school systems leaders, higher education faculty and business leaders in California and is geared to expanding learning opportunities for students across the state. We worked hard, for almost 18 months to craft a solution that we believed would move our public school system forward and ensure that we used the emerging information and communication technologies to deliver high-quality learning experiences to students regardless of where they live or attend school. I think your primary evaluation is fair. We do leave room for investment by the legislature in terms of identifying critical processes relating to funding mechanisms. What we do not do is leave open the question as to whether or not students can access courses required for entrance into the state’s universities. I do not agree with your interpretation that the initiative leaves the control of identifying online providers to the state. In fact, I believe it solidly places that responsibility in the hands of the individual school district and their governing board. That responsibility is critical for maintaining local control and oversight. David, thank you very much for responding. Things I like about your initiative..
1. Greater access to challenging courses for students who do not have access. 3. Teachers of the courses must be credentialed by Ca. I think certification as a concept is important and wish that existing certification requirements were higher than they are. I wonder if Vander Ark and INACOL agree. Here is a quote from an INACOL whitepaper about certification of online teachers.. Does this mean that INACOL supports the use of online instructors with only 30 hours of training? 4. Class size limits. Stanford’s online high school, for example, keeps class sizes at 15 to ensure that students get real interaction with their teachers and genuine feedback. Your initiative states that the class sizes should match those of the offering district. A good start. Unanswered questions I still have..
1. How will a rural brick and mortar school with limited A-G offerings fare when a not insignificant percentage of their ada is lost to institutions that provide it externally to their students? 2. If we involve for profit businesses, and do not require that the students they serve achieve certain benchmarks, what is to keep the Colorado disaster from happening in Ca? So let me take a shot at these. Let me know how I do. Certification: The issue of teacher certification and course quality were weighed very carefully by the group drafting the initiative. We looked at the iNACOL standards for online teaching and online courses and feel that those standards are very rigorous. That said, the initiative was drafted to support access to all types of courses, not simply online learning experiences. Your quote from the iNACOL whitepaper is talking about online teaching overlay certification. I do not believe that they are proposing replacement of authorizations for subject matter competency that exist in the states. The 30 hour program minimum reflected in your post if referring to what a certificated teacher would need to do BEYOND and/or in addition to their state required credentialling program. Current law provides loopholes in that area and we were attempting to tighten them up. iNACOL is supportive of the efforts to do so. There is an argument to be made that the online certification could be nationally recognized because it is an overlay to the credential. I believe that was the point the whitepaper was making. Class size: Because the initiative was meant to move public schools towards increased use of digital learning (in class and out), we specifically gave a nod to respecting existing bargaining unit agreements and support that process for districts to set expectations relating to their class sizes. This is waht we do in Riverside and what I encourage districts to do across the state. It is in nobody’s best interest to work outside of those agreements, which can be altered as the parties agree. While I do believe that some online classes can support higher student-to-teacher ratios, others require smaller numbers to be effective. That is a decision best left to the stakeholders in the local system. Impact on rural schools: I am not convinced that this will be the outcome. Fact is, I work with districts across the state to build and deploy digital learning opportunities for their students. One could make a strong argument that, given the choice to do so, rural school systems might draw proportional ADA by providing high quality options to students outside their attendance areas. The California Open Campus Initiative was designed to support those efforts, which include sharing curriculum and learning opportunities between districts within the consortia. For profits and accountability: This is a big area of concern and one of the reasons we tie opportunities for the for profit partners to district contracts and the WASC process. This is not the case today. 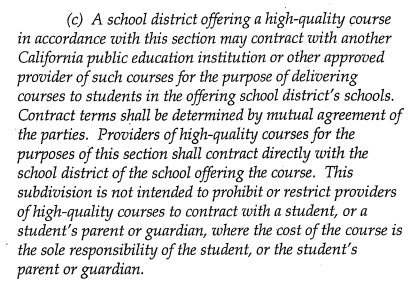 If the schools supported via the contracted agreements do not maintain academic integrity (gains), they risk losing WASC accreditation and thus their a-g list and access to state funding. My personal opinion is that we need to move towards a competency-based funding model (another initiative?). In California, we pay school district for the number of days they attend school and our pay out rate is 98% – we get what we are paying for. What would happen if we were to fund student learning based on the outcomes we are looking for instead of time spent whether or not we get there? David, forgive my delay in response. And thank you again for engaging in this conversation with me. I really appreciate the thought you put into this initiative. In your last paragraph above you mention that the act ties for profit opportunity to the WASC accreditation process. This is a good idea, but the feedback loop is a long one for that. Why not simply pay for performance? We have the, albeit poor, but at least objective, standardized tests to judge the value added for any intervention. For profit providers and their nonprofit proxies get paid if they at least maintain the same level of achievement of a parametrically matched population within the same school – and not before. One year of underfunding a school means layoffs. We can’t wait for a five or six year WASC cycle. Hi Jack – I am a big supporter of a pay for performance plan and am working on legislative language to pursue that policy. While most would be comfortable with attaching that policy to pricate providers, I support a competency-based funding model across the board. While I believe that to be the right policy, this initiative had a different purpose: addressing the lack of equity in the system in terms of college readiness and removing the restrictions that inhibit access. The competency-based funding issue will be addressed in subsequent efforts by Education Forward (www.educationforward.org). Other states are leading the way in setting examples of policies that work. While we did not want to get into the weeds with regards to the issue above, we did want to address the quality issues relating to online learning and private providers. We felt it best to tie these courses to established procedures used in the brick and mortar setting. specifically because the proposition places the accountability for these courses in the hands of the local school district. Not only does WASC play a role, a-g each course must be UC approved, be taught by a credentialled teacher, and authorized by the local school board, These are measures not currently in play in all settings. While WASC involvement in a strong performing school can span 5 or 6 years, schools that are not achieving targets are subject to shorter review periods. They have also increased the rigor of their review process for schools that utilize online instruction. That said, school boards are held to annual performance standards and much more likely to pull something that is not returning the desired results. Having attended school in California all my life and as a graduate of UC Berkeley, I have some experience with the practices of the California school district. Giving students in California access to UC curriculum sounds great. The problem is all of the political stuff that is being played out here and again the victims of all this will be the students. Also, another problem I forsee here may be finding teachers to teach the courses. What kinds of qualifications will they be looking for from teachers? Will teachers be required to take additional certification exams in order to teach the students? It appears that there are many things that need to be ironed out before we can say definitely whether this is a good or bad decision.